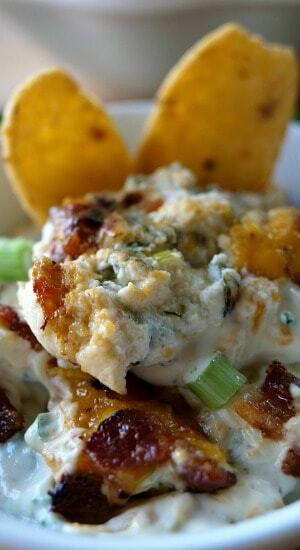 Ready for a cheesy jalapeño bacon dip that tastes amazing and is a perfect appetizer to add to the party menu? Then look no further. 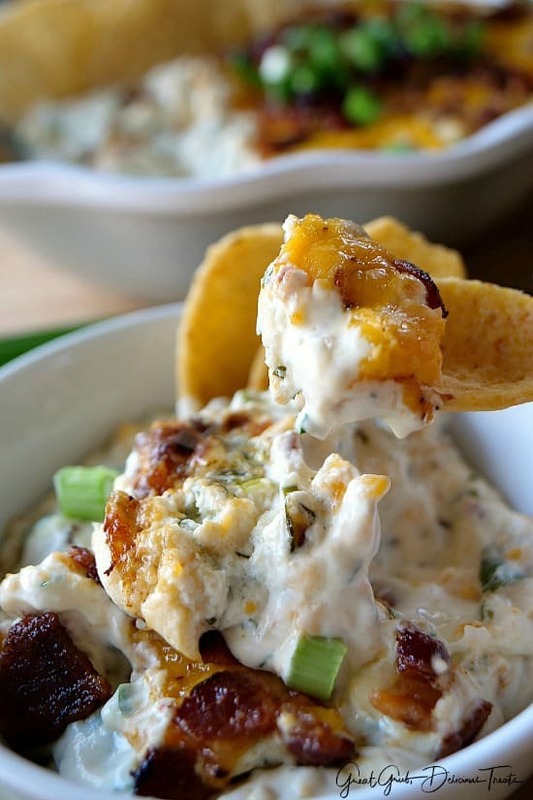 This dip is super flavorful, loaded with cheese and bacon, and a bit of spice, then served hot with corn chips or tortilla chips. 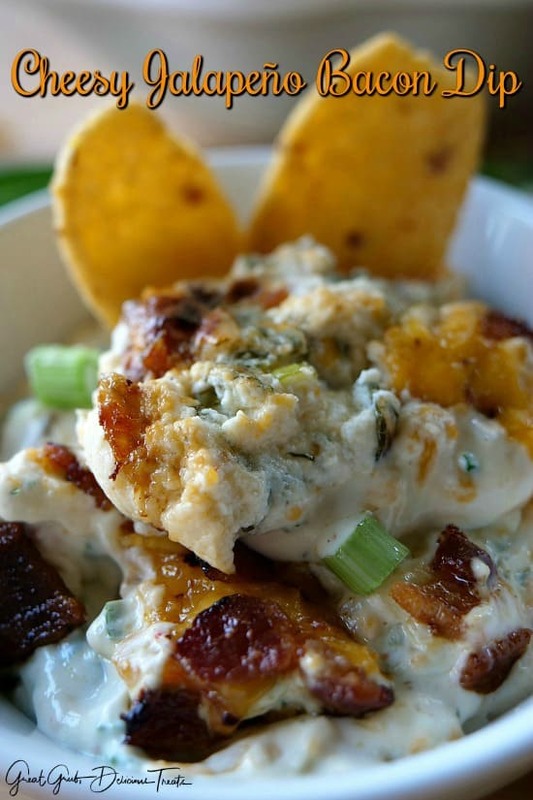 This cheesy jalapeño bacon dip makes a perfect appetizer to serve guests while waiting for the party to begin, is super easy to make, it’s quick and tastes great. Great for potlucks and family gatherings too. It’s a bit messy looking but don’t let looks fool you. 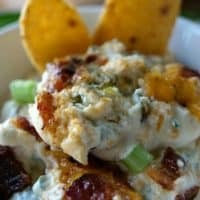 This dip is DELISH! Using spicy cheese enhances the flavor tremendously along with some diced jalapeños, bacon, green onions, and cilantro. 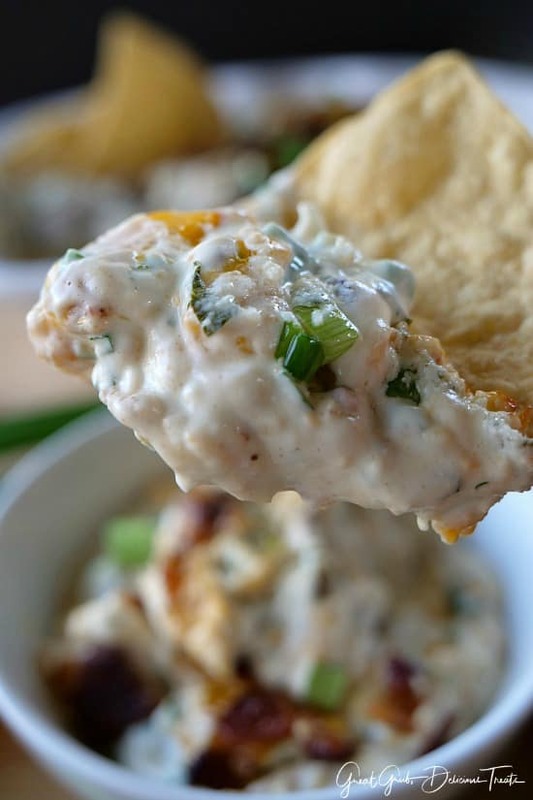 This dip is loaded with all sorts of delicious goodies and one you will make over and over. This would be great served over baked potatoes. 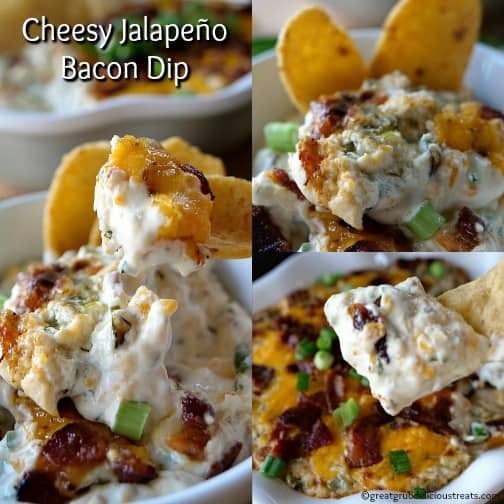 Imagine a hot steamy baked potato with this delicious cheesy jalapeño bacon dip smothered all over it. YUM! Here are some other delicious cheesy recipes you can find on the blog: Italian Sausage Penne Casserole, Cheesy Garlic Scalloped Potatoes, Crock Pot Cheesy Chicken, Cheesy Sausage Hash Brown Casserole, and this delicious Classic Lasagna which is loaded with cheese. 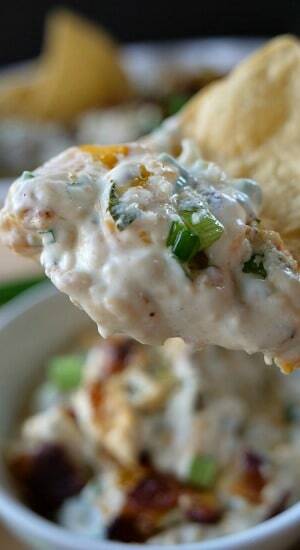 A perfect dip to add to the menu for Super Bowl parties, family gatherings, or getting together on game day. In a large frying pan, fry bacon until crispy. Remove and place on a plate lined with paper towels. Preheat oven to 350° and spray a 1 quart baking dish with a non stick spray. Set aside. In a medium mixing bowl, beat cream cheese until creamy, then add mayonnaise and sour cream. Mix until incorporated. Add cheese (saving 1/2 cup for topping), jalapeños, onions, cilantro to mixing bowl. Stir. Crumble bacon, add to bowl, stir, saving a small amount for the topping. Spoon into prepared baking dish. Top with remaining cheese and bacon and pop in the oven. Bake for 20-25 minutes until cheese is bubbly and mixture is heated thoroughly. Remove for oven, serve hot with corn chips or tortilla chips. I made this over Christmas using candied jalapenos. It was a bit hit! Awesome Lisa! I bet it was delicious with the candied jalapenos.